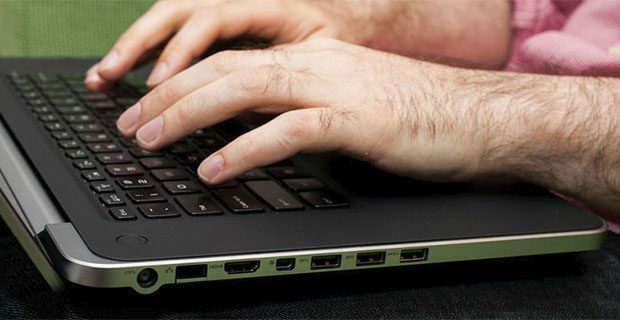 There’s a growing demand for high-end portable multimedia laptops and manufacturers struggle to get their best in front of potential buyers. The “portable” aspect is the real problem here, as a multimedia laptop needs to be fast, but cramming powerful hardware inside a thin body is not an easy task. One of the new launches in this segment is the Asus Zenbook NX500, which I’ve reviewed a while ago.With a start price of above $2000, this thing packs modern hardware inside a sub-5 pounds metallic body, enhanced by a 4K wide-gamut screen and a capable audio system. But how does the NX500 fare when pitched against its rivals, like the Apple Macbook Pro with Retina Display and the Dell XPS 15, all of them 15 inchers with premium specs and under 1 inch thick bodies? Well, that’s what we’ll talk about in this article. 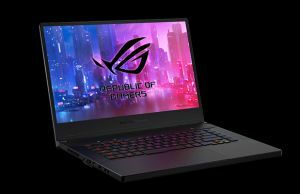 I could have included the Gigabyte P35 v2, Gigabyte Aorus X3+ or the MSI Ghost GS60 as well on the list, however, those offer higher-end graphics and are more of a rival for the Asus Zenbook GX500, the “gaming” version of the NX500. So we’ll leave them for another post. The one thing you’ll notice the moment you’ll have these two side by side is that the Zenbook has a larger footprint and is also marginally heavier. These aside though, the two feel and look spectacular, with their aluminum cast unibodies. 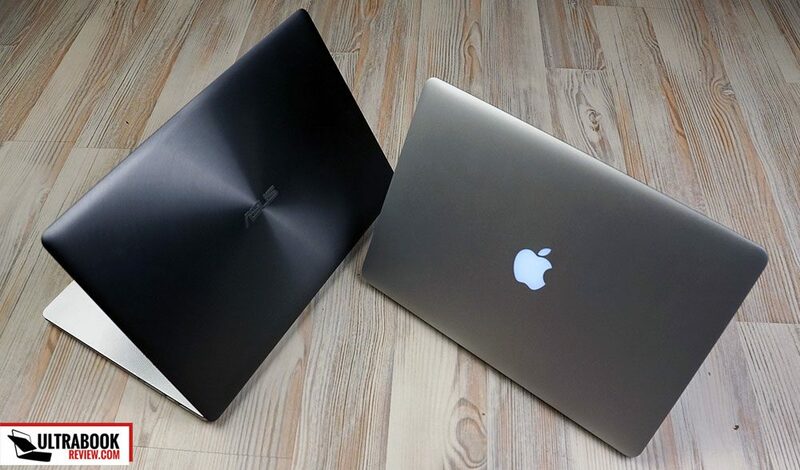 Asus went for a darker hood and a textured finishing, with their concentric circles spreading from the logo, while Apple sticks with a simpler approach, but a glowing Apple logo in the middle. There’s nothing to complain about the build quality of these two either, so they each get a point for the first impression. Opening the lids, you’ll notice that they share a common layout, with a keyboard placed in the middle, without a NumPad area, flanked by the speakers. Asus went with some drilled perforations spreading away from the CapsLock and Enter keys and the end-result looks nice, but I can’t say the speaker grills on the Macbook look any worse. Or sound worse, for that matter. Notice that both laptops feature a long screen hinge, meant to keep it properly in place, and also notice that the bezel around the display is slimmer on the MBP. Around the sides you’ll find a fair share of ports on both of these. 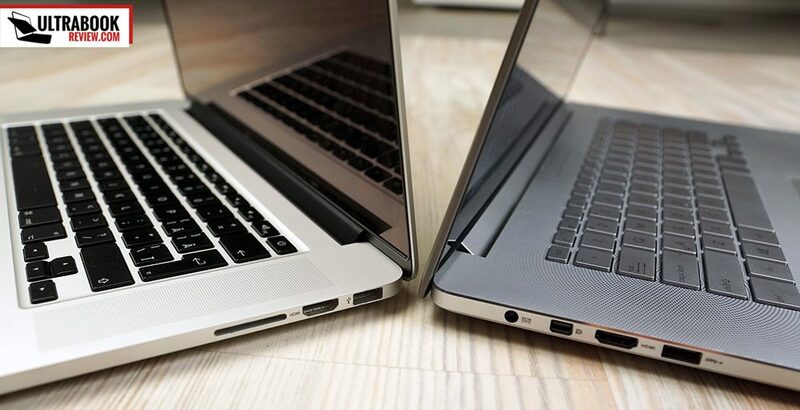 There are however only 2 USB slots on the Macbook, while the Zenbook offers 3. Besides these, both feature HDMI connectors and card-readers, but while on the NX500 there’s a single mini-DP port, on the Apple device there are two Thunderbolt connectors, which leaves room for more options when it comes to connecting various peripherals. Even so, there’s not much to complain about the Zenbook, which offers all the needed connectors, plus an USB to LAN adapter in the pack, in case you’ll ever need to connect to the Internet via wire. Let’s get back to those keyboards now though. They also share the same layout and button placement, including the power button as the top-right key and the compact arrow keys. 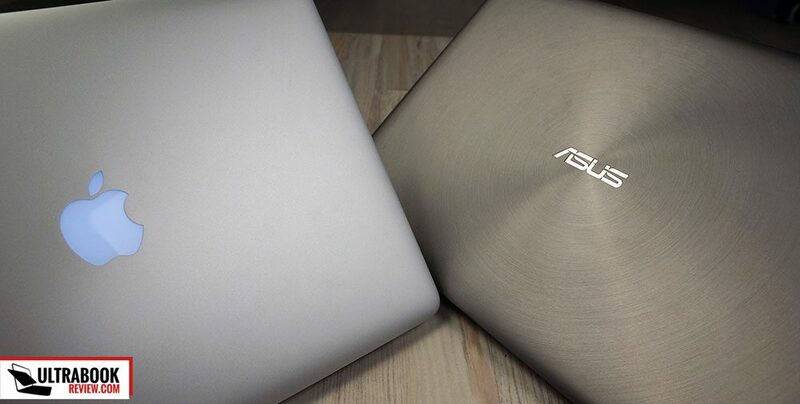 However, there’s one thing you’ll get on the Macbook and not on the Zenbook: contrast. Apple chose black keys which look a lot better on the silver body, and also allow the white-illumination to be more visible in a dark room. On top of that, the actual typing experience is somewhat superior on the Macbook as well, mostly thanks to its firmer and better feeling keys. 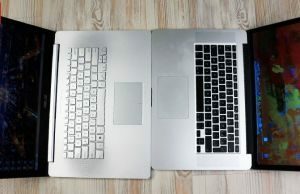 As for the touchpads, you can notice that both manufacturers went with clickpads and the one on the MBP is marginally larger. That shouldn’t make a difference, but the everyday-experience will, and again the Macbook Pro steps in front here with its more responsive and accurate implementation. The NX500’s touchpad is not bat at all, but the surface still misses occasional taps, which can get a bit frustrating. When it comes to screens, the match ends in a tie. On one hand, the Zenbook has a higher-density panel, with its whopping 3820 x 2160 px resolution, but you won’t actually miss the extra pixels when using the the Retina display on Macbook (2880 x 1800 px). At the same time, the Zenbook gets a wider gamut panel, able to cover 97% of the AdobeRGB spectrum, with an DeltaE of just 0.8 (the panel is factory pre-calibrated), while the panel on the MBP is not as impressive, but again, trails is closely enough to never perceive the difference in actual use. On the other hand, the Apple laptops gets a 16:10 display, while the NX500 gets a 16:9 one, and the extra height is no small deal. Besides these, the Retina panel is brighter (330 nits vs 270 nits max brightness) and has better contrast (1000:1 vs 750:1), which again are aspects that you’ll actually notice in use. Last but not least, the Zenbook packs a touch-screen covered by a layer of reflective glass, while the Macbook Pro offers a non-touch screen with an anti-reflective coating which does a decent job at cutting of reflections and glare, but is still not a matte finishing by any means. Both units run quad-core Intel Haswell processors with dedicated graphics and can take up to 16 GB of RAM. However, there are a few things to consider. First, the Zenbook is available with a factory-overclocked Nvidia GT 850M graphics chip which is a faster solution than the Nvidia GT 750M chip offered at the moment on the Macbook Pro. 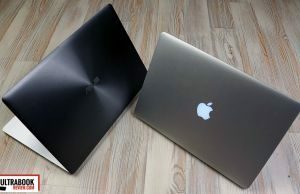 However, while the processors powering these two devices are close in terms of raw performance, Apple opted for newer silicon, with Intel HD Iris 5200 graphics, as opposed to the Intel HD 4600 graphics on the Core i7-4712HQ. And that matters for two reasons. Number 1, the 5200 is faster and thus the dedicated solution on the Macbook will kick in less often, which is going to help save battery life. And number two, it allows Apple to offer a basic version without the dedicated chips, which relies entirely on the Intel graphics. Besides these, I mentioned that both laptops can take up to 16 GB of RAM, but while the Zenbook comes with 8 GB of memory soldered on the motherboard and an extra slot that can take an up to 8 GB stick (which you can later purchase yourself), the entire amount of RAM is soldered on the Macbook. On top of this, both devices feature fast PCIE storage, however, Asus chose to use standard M.2 SSDs on their laptop (and there are two slots that can take an 80 mm and a 60 mm stick), while Apple went with a proprietary SSD connector (single slot), which makes further upgrades very difficult (because you’ll have a hard time actually finding something that will be compatible with the MBP). At the end of the day, the Zenbook offers the faster graphics solution and is easier to later upgrade. That means that you could buy a more basic version and then add more RAM or increase the storage space yourself. 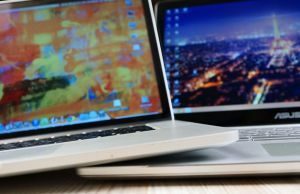 With the Macbook Pro though, your options for upgrades are limited, so you’ll mostly have to stick with what you get in the beginning, thus choose carefully. On top of that, the MBP is available in two options, with or without dedicated graphics. Now, the Nvidia GT 860M will shine primarily in games, although I did encounter some hiccups on the unit I tested, as you can see from here. 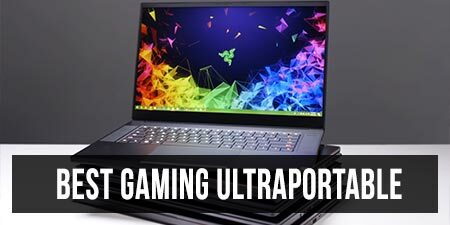 A Macbook however should not be your primary target if you’re into gaming (see this post for more gaming ultraportables), as not all titles are compatible with Mac OS, thus the fact that there’s a slower chip on this Apple laptop should not matter that much. And of course, the Macbook Pro is going to get updated to Maxwell graphics eventually, but that will probably happen once the new Intel Broadwell processors kick in. To sum these up, both these machines are going to handle fine pretty much everything you’re going to throw at them, from basic daily activities to complex tasks (running photo/video editing or programing software). The OS you prefer and intend to use, as long as the software, should have a major factor in your decision, as some things work better on Windows, and some on Mac OS. All these aside, you should know that both the Zenbook and the Macbook are going to get hot under load, and throttling is a part of the story. 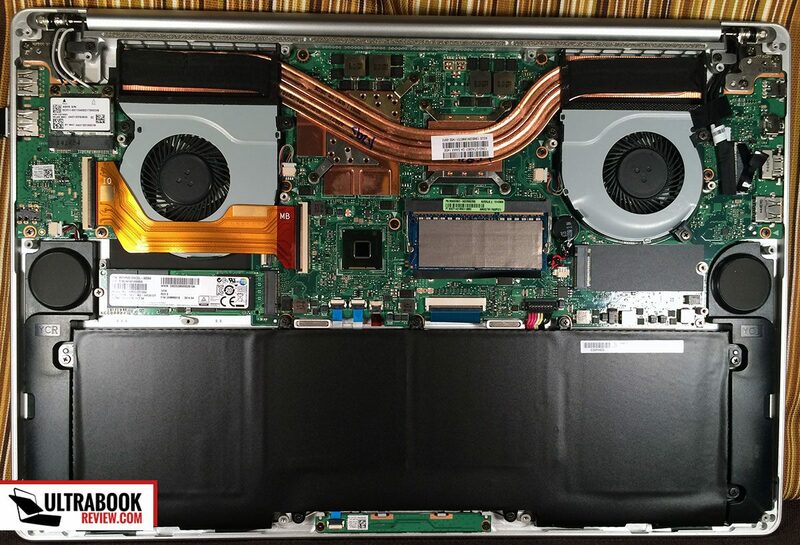 The internals do reach higher temperatures on the Macbook (the CPU can hit 100 °C on the Mac and is limited at about 85 °C on the Asus), which might have unwanted effects on the long term. However, while the Core i7-4712HQ processor on the Zenbooks throttles under load (and even when running games), the CPUs on the Mac rarely drop below the standard frequency. On top of that, the NX500 does get significantly hotter on its outer body (mainly its belly and the area on top of the keys), while the interiors get warm on both of these and leads to sweaty hands. 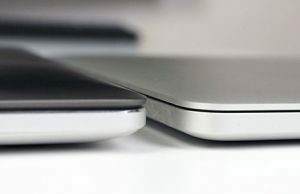 None of the two has cooling cuts on the belly, which does not help their case, and both are made from metal, which helps heat spread faster around the body. At the end of the day, if you won’t push them to the limit, they are going to remain fairly cool and quiet, with the fans barely audible. And that’s what these laptops are made for: daily use and multimedia, with occasional heavy chores and games. There is another important aspect to address before we draw the line, and that’s the battery life. 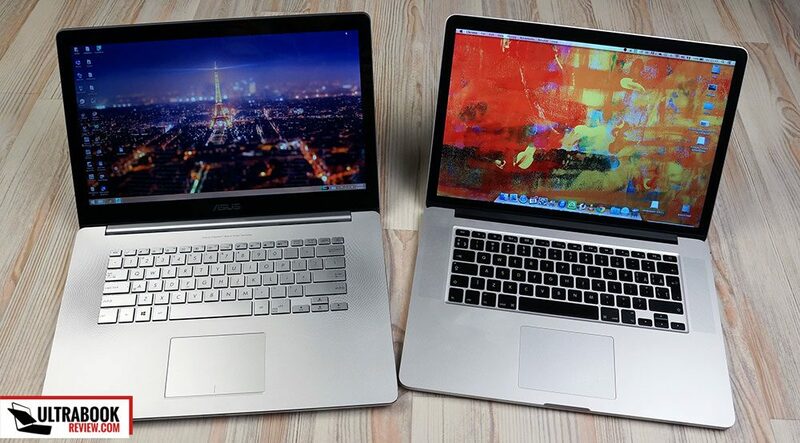 The two have similar sized batteries, but the Macbook outlasts the Zenbook by a fair amount. While the NX500 delivers roughly 5-6 hours of daily use (browsing, watching some clips, editing content and pictures, etc, with Wi-Fi On and screen at about 150 nits, which is appropriate for indoor use in a well lit room), the Pro offers around 7, maybe even more, and that despite the fact that it packs different processors, with a higher TDP. The 4K screen and probably the poorer optimization of the Zenbook pay their toll here. The NX500 is a closer match to the Dell XPS 15, as both are running Windows and can handle the same tasks. So if Mac OS is not an option for you, then you should look at these two. Our comparison is based on the Dell XPS 15 9530 Touch, the one available at the time of this post. Aesthetically, the Zenbook is once again a fair match to this rival and no longer has the size disadvantage as it did with the Mac. However, it remains heavier, which is going to matter if you plan on lugging your machine around often. Besides these, the XPS 15 really has a style of its own, while the NX500 looks too much like a Macbook copycat. Aluminum is used for the lid cover, while the bottom is made from fiber carbon. 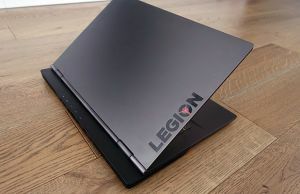 The interior is coated in some sort of soft rubbery black material, which feels really nice to touch, nicer than the cold metal of the Zenbook or the Macbook Pro. When it comes to ports there’s not much setting these two apart, but the XPS does pack one extra USB slot, which for me really matters. But it’s not something that will make you choose this laptop over any others. The typing experience might though. Both laptops lack contrast between the keys and the body around, but I do prefer Dell’s implementation, with softer and slightly concave keys, as opposed to the plasticky and wobbly ones on the Zenbook. And the white backlightning of the keyboard sure looks better on black keys than it does on silver ones. The touchpad is larger on the Dell and covered in glass, just like the one on the NX500, but fails to deliver an enjoyable experience when it comes to gestures and even freezes sometimes, which is probably a software issue, but still something you will have to live with as a potential buyer. The NX500’s touchpad does not suffer from similar issues, but fails to register taps from time to time, so it’s not perfect either. Both laptops feature high-density 16:9 touchscreens with IPS panels. The Zenbook gets a few extra pixels, but you won’t notice them in practice and perhaps the only real advantage of the 4K screen is the fact that it displays a 1920 x 1080 px canvas size in a 4:1 ratio, which leads to very sharp content when you scale the interface to 200% in Windows. The same thing only leads to a 1600 x 900 px like canvas on the XPS 15, which might be too small for a 15 incher. The Dell’s screen is however brighter (350 nits vs 270 nits) and has better contrast (1600:1 vs 750:1), but when it comes to color reproduction the wide-gamut panel of the Asus laptop steps in front, covering 97% of AdobeRGB (vs 70% on the Dell), with a DeltaE color variation of only 0.8 (vs ~5 on the Dell). But in actual use these details might not matter as much as the brightness and contrast gaps, unless you really need a color-accurate display for your work (in which case you’re probably going to rely on an external monitor anyway). An Intel Core i7-4712HQ processor pushes both these laptops, paired with up to 16 GB of RAM. The NX500 comes with 8 GB of memory soldered on the MB and an extra 8 GB DIMM, while the XPS 15 comes with two available DIMMs. Besides these, the XPS gets a standard 2.5″ 7 mm storage bay and an mSATA slot, while the NX500 gets M.2 PCIE storage (two slots). That’s going to be faster, but Dell’s solution is more upgrade friendly, as any 7 mm 2.5″ SSD can go inside the available bay and the mSATA SSDs are more affordable than the newer M.2 compatible ones. 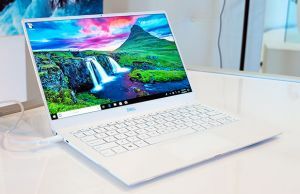 When it comes to graphics though, the Zenbook gets an Nvidia 850M chip (factory-overclocked), while the XPS 15 settles for an older Nvidia 750M solution and that’s actually visible in games, benchmarks and apps that rely heavily on graphics. However, the XPS 15 is going to get a Maxwell update as well sometime in the future and when that happens, the NX500 might not hold the leading edge anymore. Especially since the unit that I got to test encountered freezes and even throttling in games, but hopefully these will not be a problem on final retails units. Throttling is an issue for the Dell XPS 15 as well, although not as often in everyday use. Under the stress test though, both the CPU and the graphics work and sub-nominal frequencies on this one, while for the Zenbook only the CPU is going to drop below 2400 MHz. However, while Asus capped the CPU’s temperatures at about 85 °C before the frequency drops, Dell allowed it to go to 95-97 °C and that has an impact on the outer temperatures, with the XPS’s belly reaching really high value (above 60 °C). And it might have an impact on long term reliability as well. Still, if you don’t plan on running a lot of games on these two, both are going to remain fairly cool and quiet, with the fans barely audible under light load, just like on the MBP mentioned earlier. Last but not least there’s the battery life to talk about. The XPS 15 is available with either a 61W or a 91W battery and the latter is going to offer around 7 hours of everyday use on a charge. The NX500 gets a 95Wh battery and my test unit only squeezed up to 6 out of that, so the Dell is the more efficient of the two. 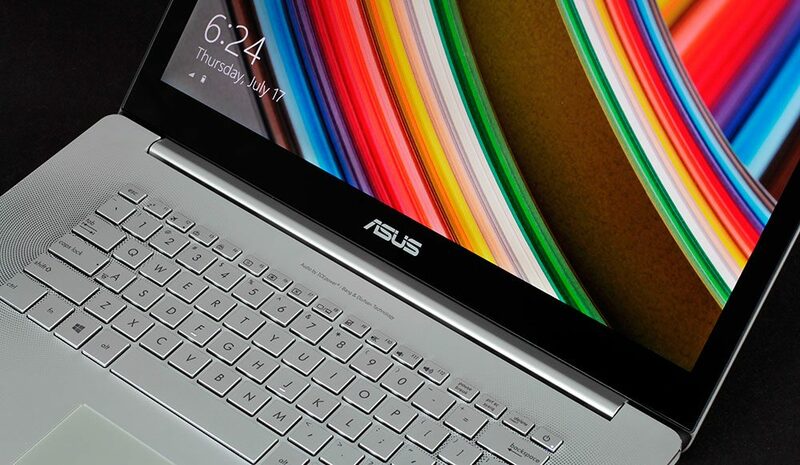 Wrapping this post up, the Asus Zenbook NX500 looks like a really solid pick right now. Spec wise, nor the Dell XPS 15 or the Retina Macbook Pro can match it, as it offers a wide-gamut 4K screen and Nvidia 850M graphics. But this final aspect is going to change eventually, so it should only matter if you want any of these laptops in the next few months. These aside though, the Macbook Pro and the Dell XPS 15 have a few positives over the Asus: they are lighter (and the MBP is smaller as well), they offer brighter displays with better contrast, they can deliver a superior typing experience and can last longer on a charge. The XPS 15 on the other hand packs a rather bad touchpad and gets really hot under load, while with the Macbook Pro there’s the issue of whether Mac OS suits you or not (and can run the software you need or not). And then there’s the financial aspect. All these start at around $2000 right now, although the NX500 is not yet available and I don’t have exact details on how much each configuration is going to cost, so I’ll have to update this part later. Anyway, $2000 will get you an XPS with the Core i7 processor, Nvidia 750M graphics, 16 GB of RAM and a hybrid storage solution (that you could upgrade yourself). At the same time, it will get you the Core i7 CPU with Iris graphics on the Macbook Pro, 16 GB of RAM and a 256 GB SSD, but no dedicated graphics. And it will probably get you the Zenbook with 8-16 GB of RAM, a 256 GB SSD and the Nvidia 850M chip, in which case the NX500 does offer more for the money than any of the others. Now, if you don’t need the dedicated graphics and don’t mind Mac OS, the Retina Macbook Pro configuration is sure going to be enough for most daily activities. If you do need the graphics, the cheapest MBP with the Nvidia 750M chip (and 512 GB SSD) sells for $2500, similar to what Dell asks for a similarly configured XPS 15. And neither can actually match the performance of the Zenbook NX500, which gives you the Nvidia 850M chip for less. Long story short, these premium devices are expensive and they all have their pros and their share of issues. 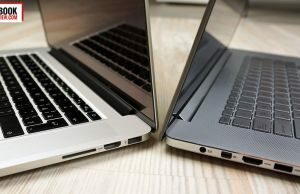 There are fewer things not to like about the MBP, but Apple’s computer is also more expensive than the Zenbook NX500 and the XPS 15, thus picking one over the other is not an easy task and should be done based on what each of you like and want from their computer. In other words, I can’t say which of these three is the better device, because each might be the right pick in a number of cases. With that in mind it’s time to wrap this up. 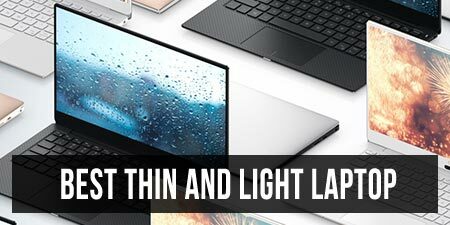 If you’re interested in premium 15 inchers, you might want to check out these two posts as well, one about the best 15 inch ultrabooks available right now, and the other about the most-powerful ultraportables of the moment. And if you have any questions about the Asus Zenbook NX500, the Retina Macbook Pro or the Dell XPS 15, feel free to use the comments section below, I’ll be around to reply. Nice article, good to read. Though I must mention most of the photos of the xps are of the older generation. Well since this category is all about mobile, low weight POWERHOUSES I can’t see how the XPS or retina come close to the ASUS? It packs TWICE the GPU performance? I would agree if it lacks on some points quite heavy. But a silver keyboard or a 270nits display (which is still bright anyway and has wider color gamut) are no dealbreakers to me. And the 0,2ghz slower CPU, who will notice that? Andrei, Any idea when’s the NX500 supposed to hit the market? What this review is missing is how the hardware of each, especially the 4k display, is supported under Linux. I don’t run proprietary operating systems anymore. I have been hearing a lot of complaints about the XPS 15 and the number of defective units being returned. I am going to stay away from Dell. I absolutely need a laptop that plays well with Linux because I use it as my main OS so the MBP is out of the question. Also, if I am going to dual boot I might as well do it with Windows since it has a much larger software library than OSX, if I need something I cannot get on Linux. Also most rooting and ROM flashing tools are better implemented on Windows than on any other platform, especially OSX. My problem is that I don’t want a laptop with dedicated graphics since Nvidia drivers don’t work too well on Linux and you end up with shorter battery life and sometimes overheating. I also need something with at least 8GB RAM and a 512GB SSD. It also has to look aesthetically pleasing. I am in quite a bind here. from my experience I would recommend to stay away from XPS 15. They are not reliable, and Dell support has no clue how to fix them. My new XPS 15 worked for 3 weeks, had a blue screen crashes once in a while. After 3 weeks, hard drive crashed. I sent to Dell for repair. After 10 days I got it back, and it was not working at all. Blue screen crash happened every few min, and Dell support was completely helpless and useless. Customer service is horrible, and it took me over the month arguments to return it back (Dell said since I own it for over 30 days, I can’t return it even it’s in not working conditions.) 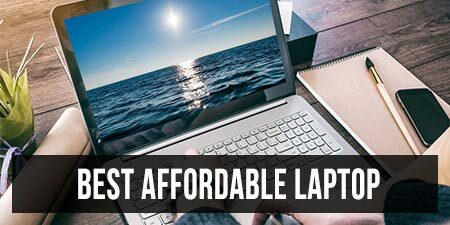 It’s better to pay extra and get reliable laptop. I want a fast and capable computer for the daily grind, but I also like to play games like Diablo III, League of Legends, and Starcraft 2. Based on my usage, which would you recommend Andrei? Is the Iris Pro plenty of power for those games or should I at least be getting the 750M? 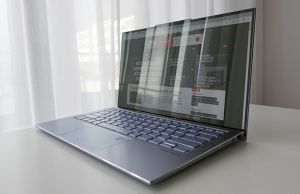 you’ll find a few gaming results I’ve got on the Asus UX301LA with Intel HD 5000 graphics over here: https://www.ultrabookreview.com/3533-asus-zenbook-ux301la-review/#a5 . Iris will do if you’re willing to play those games on 13 x 7 resolution with low details. If not, you should get a computer with dedicated graphics. The only dif is that the NX500 has 12GB RAM and the XPS has 16. Leaving all this reviewing politics B******T aside, if you would have to buy one tomorrow, which one ? Well, can’t say for sure. If I were to judge the NX500 from the early-review unit that I tested, I’d probably say the XPS because the NX500 encountered those annoying throttling issues which actually affected gaming performance. The XPS 15 gets hotter and still throttles, but not as badly. However, if the final version of the NX500 won’t throttle as badly, I’d probably go with them, for the wide-gamut screen, superior graphics (that 850M chip is overclocked, so there’s a significant jump from the GT 750M on the XPS) and overall lower body temperatures. But the NX500 is not yet shipping, is it? Are you sure that 1500 quid price tag is correct? Is Samsung planning to offer a Series 9 with nVidia card? If you don’t need a dedicated card it could be the best option, but I need to have a powerful GPU. Latest rumors point towards Samsung completely discontinuing their laptop line, so no, I don’t think there’s going to be an ATIV Book 9 with dedicated graphics. Or a newer Ativ Book 9 at all, for that matter. But we’ll see. 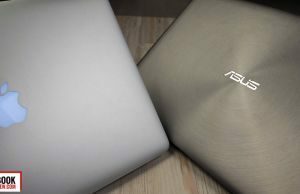 I was wondering about two laptops: the Asus Zenbook NX500 and the ASUS ROG GL551JM-DH71. If you would choose one, what would you pick and why? Still no info on the release date of the NX500? Do you know when dell normally refreshes the line up? Hoping for a xps 15 with Broadwell and Maxwell to be announced, as the xps 15 looks like the best alternative to a macbook pro that runs windows. Full Voltage Broadwell CPUs are scheduled for early next year, so I don’t think we’ll see a refresh in the next few months. May you include the LUT specs for the respective screens? That makes a big difference in screen quality and is glaringly absent from quite a few review sites. Any news about realese date? Well since July I’ve been looking for a new laptop and since I have seen the ASUS NX500 in the early reviews I’ve fell in love of that super machine!! But now I’m getting angry for too much waiting!!! When will be available in US?!?!?!?! End of november I heard. 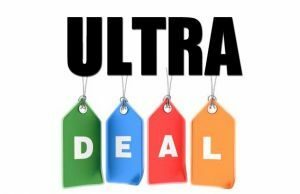 I’m looking for an ultrabook that can handle video editing with Camtasia. I don’t want a Mac, so do you know wich spec can handle that? Im in dilemma – Asus or Mac; I need ultrabook for photo editing, movie editing, music etc. I was told that Mac is the best solution, and the only for that matter ( final cut etc ) but I saw this Zenbook, and it seems to me that it is quite similar, on specs and even better designed. Well, specs for price, the Zenbook is a better deal. You should think about the software you’re planning to use. Yes, Final Cut is only on Macs, but Windows has plenty or good options as well. Adobe’s suites do work well on both. On the other hand, there are still some questions yet unanswered of the NX500 (performance under load, temperatures, battery life, final price? ), as this one is just starting shipping in some countries in Europe (and not in the US, from what I know, but I might be wrong). So if you’re in a hurry to buy something, this Zenbook might not be an option as all. 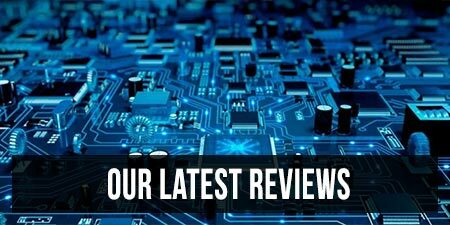 great review, personally what would you choose, the dell or the asus? I do casual gaming and 3d designs and battery life is important to me. Tough to say. The Dell is more affordable and easier to find than the Asus, but it does get quite hot under load. If you’re willing to deal with that, then perhaps the Dell would be the smarter pick. But it really depends on how much the Zenbook costs where you’re living. For the longest time I had thought that the Dell XPS 15 had an IPS panel, but that is in fact incorrect. It appears to have a MVA (or maybe PPS) panel instead. Great review – thanks very much. Exactly what I needed. I am looking for a portable laptop with good/great battery life and a great screen too (also larger size about 15 inches). I don’t mind the gaming aspect. Don’t really play too many games, and if I play they are old ones. My work is mostly going to be on text/Linux. Which laptop should I prefer out of Dell XPS 15 and Asus Zenbook ? Is there anything else I should consider? Also, Is heating a really big issue in Dell XPS 15 that we don’t see in Zenbook ? Both will heat-up under load, but the XPS will reach higher temperatures. Both laptops have their pros and cons though, as stated in the post. You’ll have to decide for yourself which way to go, you’d still have to compromise somewhere. Great article Andrei. Do you know if the NX500 is currently on sale in the UK? I’ve been unable to find it online anywhere. Was it pulled from the market perhaps? Also, if it has been released, have you any idea if the over heating issue been resolved? Thanks. I’d like to see this comparison updated to include the 2015 XPS 4K Touch. Thank you for your reviews. I currently have an older MacBook Pro that has reached its’ limit. I am an amateur photographer with about 30,000 photos in my library. I use the computer to edit photos and listen to music, some internet, no gaming. My main problem with my current Mac is that it cannot multitask and I spend most of my time watching the beach ball spinning. I want to get a new laptop and am deciding between a new MacBook Pro and an Asus product. Asus is a bit confusing with all the models, so I am wondering what you would recommend. My main requirement is speed-I have the patience of a gnat when it comes to the computer. HI Maria. Let me get this straight, you’d looking at a 15 inch full-size laptop, right? If that’s the case, the rMBP is probably the best option if you’re on an unlimited budget, with the Asus NX500 as a close second and the Dell XPS 15 with Infinity display close by. Stay away from the Asus UX501, it’s cheaper but has a defective screen (with color accuracy) and you’ll absolutely need a great one if you plan to edit photos. I am an architect and I need a powerul laptop that can deal with softwares such as Autocad, Rhino, Sketchup, Photoshop, Illustrator etc.. I’ve owned an Asus N series product for many years now and I never had a problem with its performance so I really liked Zenbook NX500 but would you also recommend it? What’s you budget? And I can’t exactly understand what you’re asking. Is that my opinion on the NX500? Is that the laptop you’re interested in? I am asking your opinion on NX500 for these kinds of tasks yes. My budget is 1000-2000$.